This is one of the products from the StarMag(TM) range. 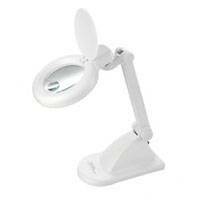 The hands-free crystal clear large magnifier is ideal for seeing detail when fly tying, crafting, painting or reading. It has a very sturdy weighted base and a long reach 46.5cm/ 18" flexible arm which can be easily adjustable to any position. The quality 13cm/5" large lens provides a 1.75X magnification (3 diopter).  Large magnifying lens for all detailed tasks.  High quality 13cm/5" lens with 1.75 X magnification (3 diopter).  Rimless lens for comfortable uninterrupted view.  Flexible 46cm/18" arm for long reach and easy adjustment.  Stable base for accurate positioning on tables. 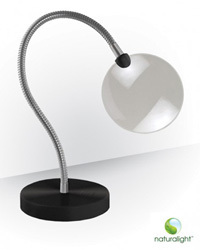 Naturalight lamps last up to 10 times longer than ordinary bulbs and in addition produce a full spectrum light that reduces glare and eye-strain making close-up tasks like fly tying, reading, writing, sewing and general inspection work easier.  Height: 35cm / 13.7"